Kagumo is located on the western slopes of Mt Kenya and eastern slopes of the Abadare Ranges. Seven committee members – coming from the FCS – manage the washing station, with the secretary manager acting as executive officer responsible for day-to-day management of the coop activities. 60 permanent staff support the executive officer and the wetmill services four villages. In 2004, four factories formed the Aguthi FCS, which Kagumo serves. Cherries are selectively handpicked and delivered to the wetmill on the same day. These cherries are sorted at the wetmill prior to pulping, where ripes are separated from under- and overripes. All processing uses clean river water from the Rundu River that is recirculated prior to being disposed of in seepage pits (to prevent contamination). Once parchment is fermented, it is washed and then sundried. The dried parchment is then milled and bagged at Kofinaf mills and either sold through the Nairobi auction or directly to international buyers. There’s no doubt: Kenya is an amazing coffee destination. Coffees from this origin are known for their powerful aromas, refreshing acidity, flavors of sweet berries, rich mouthfeel, and clean and lingering aftertastes. Years of experience have really taught us how to limit our search at this origin, but we are always open to surprises and are ready for new partners and flavors. Kenya has a well-established and well functioning auction system. Dormans, based in Nairobi, is where we usually go in order to sample coffees we are interested in buying. Dormans has a reputation for retaining good cuppers. We like them, we trust them, and they rigorously search for the best coffees to offer us. In the peak of the buying/auction season they will screen thousands of coffees each week. Dormans has a license to buy at the auction and they are also partner to a marketing agent/mill—Central Kenya Coffee Mill (CKCM)—where coffee is processed after it finishes drying at the factories. The washing stations that produce our coffee pride themselves on having some of the best-paid cherry producer members in the country. 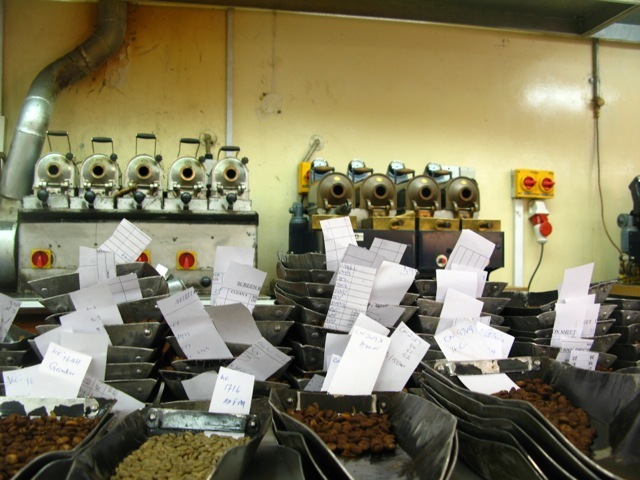 The system at the Kenyan Coffee Auction is refreshingly transparent in its communicating where coffees come from, its systematic organization of coffee by screen quality (such as size and physical attributes), and in its practice of rewarding cup quality/sensorial attributes. Most coffee producers in Kenya are “smallholders”. Each producer’s total volume might only be a few bags, thus hundreds of farmers, when living in the same area, are likely to be members of a cooperative, which markets and sells coffee on the whole community’s behalf. Each cooperative typically runs several “factories” (i.e. processing and washing stations) where producers deliver cherries from their farms. Sometimes a producer chooses to deliver to the closest factory but some prefer delivering to a different factory, due to differing management practices. The usual reason for choosing one factory over another is based on the prices a given factory manages to obtain for its cherries. Good management at a good factory will not allow for unripe or unevenly matured cherries. This is because accepting such cherries damage the potential to receive optimum prices for everyone concerned. We pride ourselves in knowing the factories we buy from pride themselves on ensuring their community of members deliver only red and mature cherries. In Kenya’s market make-up, cherry price is directly linked to cup quality. In Kenya, a cooperative is a democratically run organization with producers acting as both members and as representatives of the governing board. One key function of the board is to nominate a marketing agent: a body/organization/company that retains a license to sell the coop’s/client’s coffee at the highest possible price. This works in both parties’ interests. Normally a coffee lot is sold at auction, but it can also be sold outside auction if the coop and marketing agent believe they can get an even better price outside auction through selling directly to a customer. That is where we come into the picture. In the last few years we have taken advantage of the possibility of buying coffees directly from, or at least in understanding and agreement with, the cooperatives. The cooperative is the seller of the coffee and always wants the highest price possible in recognition of: 1. The hard work of quality oriented farmers and factories, 2. Cup quality, and 3. In recognition of the current price of coffees of “similar quality” being sold at auction in Nairobi. Negotiating the price of the best coffees is important to a buyer eager to secure lots before it goes to auction where somebody else might buy it. The price offered has to be high enough for the cooperative to ensure it won’t be sold better at auction, which can, in turn, discourage quality-minded producers. As a matter of fact, all the best coffees are sold this way, thus the only way to get hold of these lots is to be present at origin while they are coming from the mill. In Kenya, a “coffee lot” is made from a bigger batch of coffee that is delivered to the dry-mill from a cooperative on a given day. When a coffee batch arrives at the mill, it is processed (hulled), analyzed (technically and sensorially), screened (separated due to bean sizes) and given an outturn-number. While the parchment is taken off the beans in the hulling process, the beans are screened and separated due to shape and size. AAs are flat with screen size 17+. ABs are flat with screen sizes 15 and16. PBs are pea-berries. There are always a certain percentage of lower grades too. Screen size does not necessarily correlate with quality in terms of flavor attributes. For example, sometimes we find many of the AB-selections to be superior to the AAs from the same lot. In addition, it is not true that PBs are necessarily more intense in flavor or better in quality than flat beans. Acidity junkies love cupping in Kenya. The questions are much more about “how” and “what kind of acidity” one wants in the coffee, rather than whether one can find it. We work hard to get these Kenya lots in quick and fresh so roasters can have all the acidity you wish to play with. Look for a well prepared, vacuum-packed and clean selection. London has become a second home for us at the Collaborative - especially at Prufrock Coffee, which has now welcomed and helped us co-host several cuppings since the very beginning. We have cupped some fantastic coffees and met some great coffee people within these walls, and now we are heading back to our London home again next week. This time around, however, we have another venue and event to talk about: an exclusive cupping of coffees from Hacienda La Esmeralda at The Association. We have developed a great relationship over the years with the Peterson family, owners of Hacienda La Esmeralda. Throughout the history of Panama's Best of Panama competition, the Petersons and their geisha coffees have performed very well - winning or placing close to the top, many times. The quality and unique flavour characteristics have become so well regarded, that the family decided to hold their own auction, where lots are separated amongst their farms based on geographic areas and microclimates, and picking dates. These auction coffees comprise the Hacienda La Esmeralda Special lots. Since 2006, we have been buying coffees from the Petersons and will offer their Esmeralda Boquete geisha blend this year, as we did last year. In addition to the Boquete Blend, we are excited to announce that we will be cupping this year's auction lots at The Association next week. This is an opportunity to be amongst the first to taste these amazing coffees, as well as provide interested roasters the opportunity to organize a buying group during the auction, which takes place on May 21st. The next day, as part of UK Coffee Week, Prufrock is co-hosting a cupping where you will again have the opportunity to taste Esmeralda's auction lots. In addition, cuppers will taste fresh crop Guatemala and Honduran coffees from our friends at Bella Vista in Antigua and San Vincente in Santa Barbara. This is your chance to decide which lots are coming to Europe and into your roasteries before they are shipped! Also in the mix are soon-to-arrive Kenya coffees and again, you will have the opportunity to reserve the names you want offered in your menus. We have known for a while that the 2013 harvest would be a little later than last year; the crop smaller. As a result, we have been expecting improved quality from last year: more intensity in flavor and better processing. And this is exactly what we have found! Timing is key The cooperatives have held onto their coffees until recently, waiting until the market went up. In the Nyeri region, the cooperatives we usually like best, have kept their coffee at their warehouses to rest, but have also "timed" when to present them to the Kenya Coffee Auction in Nairobi, where they are trying to fetch as high a price as possible. We don't blame them for this. That said, one of the reasons we were there now is to buy the best coffees before they are presented to the auction at all. These days, the very best coffees aren’t usually sold at auction; they are being sold right off the cupping table! Thus, we need to be present at origin, tasting all the coffees and informing the coops what we want before anybody else does. The competition for the best lots is fierce. And fun. Perfect timing is best We could have been in Kenya two weeks ago and we would have gotten first choice on some lots. At the time, however, there was much less variety in the coffees being offered. We could have waited until after the elections in March to go: a time when most coffees are made available. But this is too late - the best lots would have been sold in the meantime. We want to get first pick of the best lots, but we also want to choose from as many lots as possible, which is why last week proved to be perfect timing for choosing the best lots from the 2013 harvest. Mission completed It should go without saying that we always cup blind. Still, we usually end up choosing lots from the same cooperatives we have liked in the past. Frankly, these consistent favorites are now famous and internationally recognized for producing the best Kenyan coffees, fetching the best prices and in turn, paying the best prices to farmer-members. Overall, this is a win-win situation we like being a part of. On Screening and Quality Selection Size matters, but not always in the way one would think. In Kenya, a coffee "lot" is made from a bigger batch of coffee that is delivered to the dry-mill from a cooperative on a given day. When a coffee batch arrives at the mill, it is processed (hulled), analyzed (technically and sensorially), screened (separated due to bean sizes) and given an outturn-number. While the parchment is taken off the beans in the hulling process, the beans are screened and separated due to shape and size. AAs are flat with screen size 17+. ABs are flat with screen sizes 15&16. PBs are pea-berries. There are always a certain percentage of lower grades too. For example: the whole truckload of coffee from Gatomboya’s warehouse that arrived at the mill in Karatina last week was given the outturn-number 20CK0032. Let’s say this outturn is 30% AA, 55% AB, 5% PB and 10% lower grades. These qualities are of course kept, tasted and sold (or auctioned) separately. In actual fact, we are getting Gatomboya 20CK0032 in AA, AB and PB because we think there is an interesting and consistent good linkage amongst the various screen sizes. Screen size does not necessarily correlate with quality in terms of flavor attributes! For example, last year we found many of the AB-selections to be superior to the AAs from the same lot. It is NOT true that PBs are necessarily more intense in flavor or better in quality than the flat beans. The only truth is that EVERY lot and ALL qualities must be evaluated. Separately. As Always, Cupping is Key. That said, we do see some patterns. This year we have found many of the AAs to be superior - by far. (Thus they come with a much higher premium.) Still, all the qualities we have chosen are the best in their respective category. All the AAs this year are stellar! Before we get into the following, I want to make note that much of the previous two posts, as well as what will follow in this one, is necessarily detailed. We are being detailed in an effort to be transparent. Transparency doesn’t just have to do with prices; the buying process is complex and has been unnecessarily vague to those not buying coffee on the ground. We’re changing things. So when you read these posts, much of the information on buying process goes for all the origins we work with. Cupping for potential is something we do a lot. We have to. Some coffees are fantastic when they are fresh, but some do not express their best attributes at the time of first cupping – it’s simply too early. Sometimes coffee is presented right off the drying bed and is so fresh it expresses in ways that may not follow-through in later cuppings. It can go either way. Sometimes the coffee will become even better than during the initial cupping, sometimes worse. At origin, coffee is usually stored in parchment up until the moment it will be cupped, or is sent for cupping. The process of preparing a sample is an important process but just as important is knowing/understanding what one is assessing when tasting a sample. For example, is the coffee a representation of everything in the lot, is it a screened representation of what is being offered, or is it a readily prepared coffee? We sometimes talk about the taste of parchment in a coffee: how fresh it is, as well as how and when it was hulled. These things matter. As an example, a slight upward variance in moisture content (i.e. coffee that has not sufficiently rested after drying and has too high a moisture content), combined with being stored in a tight plastic bag in a warm environment, right after parchment is taken off, will affect the resulting flavor profile, whatever the coffee’s inherent qualities were. During my visit to Central Kenya Coffee Mill (CKCM) in February 2011, the floor at the warehouse was barely littered with coffee bags. This year, the warehouse is filled to the roof. There has been a serious congestion of coffee coming into the CKCM mill from the cooperatives. Coffee has been kept in parchment and was theoretically ready to be milled in early January. The parchment coffee is "resting" in open bins and while they are under a roof, they are still exposed to moisture from outside air. Due to the unusually high volume of coffees that were processed and dried in December, and because of rains in the Nyeri district in mid-late December, coffees may have been put in resting bins prematurely. In any case, at the time of delivery to CKCM it was also discovered that there was a need to re-dry some lots under open sun. Re-drying is okay, but it can also damage the coffee if it has not been properly dried in the first place. This has been an issue all over Nyeri this year. Last week while at the tasting lab in Nairobi, I tasted some parchment samples (i.e. samples taken from a lot that is then hulled but not screened). All bean sizes are present within this kind of sample. However, I mostly tasted samples of AA, AB, PB grades – these are coffees that have already been milled, screened and are ready to be packed and shipped. I even had the opportunity to taste comparative parchment samples of AA, AB, PB screenings from the same factories: Karagoto, Tegu, Ngunguru. This provided a pretty good picture of what is going on at these places. The coffees I liked best had outturn numbers (i.e. an identifying number given to a coffee lot when it arrives at CKCM that tells us what stage in the harvest it is from) from weeks 15 to 20 (Week 1 begins October 1st) – different samples of lots from the same factory. It is fascinating to taste how different coffees from the same place can be everything from awesome to just plain awful. And Without Further Ado… Tasting Notes! KARAGOTO AA I have tasted at least a dozen Karagotos and with some reasoning, I would guess that the lot we ended up choosing (from outturn week 17CK) is from, more or less, the same outturn as the ones I tasted in December 2011. These were picked and processed in the very beginning of November. Our experience with Tekangu coffees over the last five years is that the earlier pickings are the better ones. Cupping notes: Intense aroma with floral notes. Sweetness, as if from well-matured fruits, a well integrated acidity, clear berry attributes. A full-bodied mouthfeel and juicy aftertaste. TEGU We have passed on buying at this stage. The tastings in December proved a little disappointing, generally due to weaker intensity and more anonymous attributes; particularly in comparison to sister factories, Karagoto and Ngunguru, which to me are STELLAR this year. However, we will continue to cup samples from Tegu from newer pickings/millings as the season proceeds. We are hoping for great stuff and if we find any, those lots will come in the next shipment. For now, we will not buy Tegu just because of its (well-deserved) fame. It has to prove delicious too, baby! NGUNGURU AA, AB, PB We are getting a lot of Ngunguru this year, which is an absolute pleasure. Interestingly, the various screen qualities, as well as varying stages in the season (outturn weeks 15CK to 20CK) show beautiful nuance/complexity in character. Overall greatness in this coffee. The earlier pickings showed more complexity and balance; newer pickings show fresher acidity and transparency. Cupping notes: Intensely floral aromas. Good sweetness, crisp and well pronounced acidity, distinct flavors of red currant (AA), fresh peach (AB), and darker berries (PB). Clean and elegant mouthfeel with a lingering aftertaste. KANGOCHO AB, KIENI AB, KARATINA AB, GATOMBOYA AB I have chosen these AB lots, some from earlier pickings in the season (outturn week 16CK), some from later pickings (outturn weeks 19CK & 20CK). All express what I find to be desirable and classic attributes. Cupping notes: Intensely sweet and heavy aromas. Sweetness and flavors as if from sun-matured blackberries, with an acidity giving it spine and strong character. Velvety mouthfeel with a soft and lasting aftertaste. Acidity junkies are raving in Kenya. The question is: how much and what kind of acidity one wants in the coffee, rather than whether one can find it. We'll work hard to get these Kenya lots in quick and fresh this year so you roasters can have all the acidity you wish to play with. Look for a well prepared, vacuum-packed and clean selection. Get in line for some Kenyan awesomeness! One of the few truths in coffee is that cupping is key! If you want to understand a coffee you need to taste it. If, however, you can’t cup the coffee yourself, work with coffee cuppers you trust. Part of this trust comes from being confident not only in the other’s palate but, just as crucially, in his ability to be able to communicate, meaningfully, the essence of the coffee's character and flavors. My trip to Kenya this week was for the purpose of finding the best lots of 2011/2012 and to bring them to market. Our goal is to get what we think are the best lots of this year’s harvest to roasters anticipating fantastic Kenyan coffees. My mission for this trip was to cup as many coffees as possible but this work was focused; we are not “starting from scratch” every time we come. Years of experience have really taught us how to limit our search at this origin. At the same time, we are always open to surprises and are ready for new partners and flavors. Kenya has a well-established and well functioning auction system. The coffees are unique in flavor profile, which is very difficult to replace. As a result, Kenyan coffee has its own price dynamic in the international coffee market that, even if it follows the NYSE to some extent, will ultimately be sold with solid premiums on top of "the C". Most coffee producers in Kenya are so-called small holders. Each producer’s total volume might only be a few bags, thus hundreds of farmers, when living in the same area, are likely to be members of a cooperative that is marketing and selling coffee on the whole community's behalf. Each cooperative usually runs several "factories" (i.e. processing and washing stations) where each producer delivers cherry from his farm. Sometimes a producer chooses to deliver to the closest factory but certain producers prefer delivering to a different factory, due to differing management practices. The usual reason for choosing one factory over another is based on the prices a given factory manages to obtain for its cherries. Good management, hence a good factory, will not allow for unripe or unevenly matured cherries. This is because accepting such cherry damages the potential to receive optimum prices for everyone concerned. We pride ourselves in knowing the factories we buy from pride themselves on ensuring their community of members deliver only red and mature cherries. In Kenya’s market make-up, cherry price is directly linked to cup quality. Still, one must cup for himself! In Kenya, a cooperative is a democratically run organization with producers acting as both members and as representatives of the governing board. One key function of the board is to nominate a marketing agent: a body/organization/company that retains a license to sell the co-op’s/client's coffee at the highest possible price. This works in both parties’ interests. Normally a coffee lot is sold at auction, but it can also be sold outside auction if the co-op and marketing agent believe they can get an even better price outside auction through selling directly to a customer. That is where we come into the picture. At this stage (when coffee has been delivered and processed at the factory), coffee is not ready to cup. The marketing agent, at least in our case, partners with a company that does the dry milling of the coffee still in parchment. These parties also grade, check quality, and record volumes of each coffee grade (i.e. AA, AB, PB, etc.). Finally, they prepare samples for potential buyers. If the marketing agent chooses to sell the coffee at auction, which is generally the case, they need to present a "catalogue" of coffee lots in good time to the market, prior to auction. Auction takes place every Tuesday during the season, beginning on the 1st of October. Catalogues are prepared and presented each auction week by the various agents. In addition to providing a catalogue, each agent must provide samples to potential buyers. Potential buyers must have a buying license. One such buyer is Dormans, based in Nairobi, and we usually go to them in order to sample coffees we are interested in buying. Dormans has a reputation for retaining good cuppers. We like them, we trust them, and they rigorously search for the best coffees to offer us. In the peak of the buying/auction season they will screen thousands of coffees each week. When we arrive we are presented with just a few hundred of these. These coffees are representative of the best presented to the market. We spend days and days screening these lots in search for what we actually end up buying. If necessary, we'll re-roast coffees to ensure each has been given a fair shot. We also re-cup the “winning lots” many times. I prefer to cup blind when decision-making is the agenda. As it so happens, coffees from many of the same factories stand-out on the table, as though old friends are re-visiting. These friends include Karagoto, Tegu, Ngunguru of Tekango co-op, Gichathaini, Karagocho, Ndaroini of Gikanda co-op, amongst others. These stand out, time after time, year after year. But there are more! As with a good group of friends, new members sometimes join. We are always welcoming of new and exciting coffees and are buying new ones even more than usual, now that we are supplying more roasters excited about great, diverse and unique coffees. Dormans has a license to buy at the auction, but as it also happens, they are sister company to a marketing agent/mill where coffee is processed after it finishes drying at the factories and leaves the resting bins. This means we can test coffees way before auction. I always like to go to the mill (CKCM in this case) anyway, to get closer to the action. Ernest at CKCM, who we mentioned in the last post, awaits us each visit and sets up tables of coffees he thinks will be of interest, in addition to coffees from factories we already buy from (due to their consistent and indisputable merits). In the last few years we have taken advantage of the possibility of buying coffees directly from, or at least in understanding and agreement with, the cooperatives. The cooperative is the seller of the coffee and always wants the highest price possible in recognition of: 1. The hard work of quality oriented farmers and factories, 2. Cup quality, and 3. 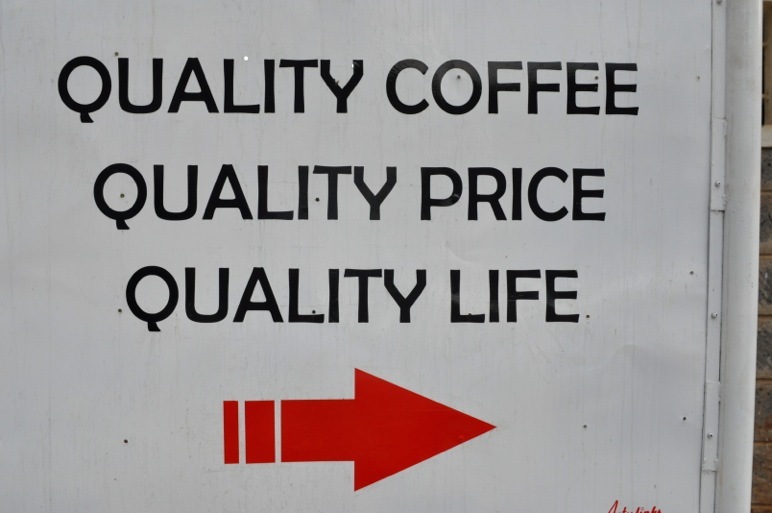 In recognition of the current price of coffees of "similar quality" being sold at auction in Nairobi. Negotiating the price of the best coffees is important to a buyer eager to secure lots before it goes to auction where somebody else might buy it. The price offered has to be high enough for the cooperative to ensure it won’t be sold better at auction, which can, in turn, discourage quality-minded producers. As a matter of fact, all the best coffees are sold this way, thus the only way to get hold of these lots is to be present at origin while they are coming from the mill, which is now. And we were there to accomplish this! The question is always: when is the best time to visit to cup? Well, we have chosen to go early and to come back in time. The crop was a month late this year, thus I was there about a month later than usual. Last year, I must say, we managed to get hold of some pretty good stuff. The timing just felt (and was) right. This year we will buy more coffee, spread from various stages of the crop, from various factories, and even from the same factory but from various representative dates of the season. We want to bring the freshest coffee possible to an eager and freshness-keen market as soon as possible. For the next shipment after this one, just a few weeks later, we are selecting and expecting even more of the good stuff. Why wait longer and settle for less? We want to buy direct (i.e. as directly as is possible; in Kenya’s case, outside auction). As soon as we have settled prices with our suppliers, we will announce what they are, as well as being totally clear and transparent about other costs necessarily brought into the equation of bringing in each kilo of coffee; costs for all the processing and handling that coffee goes through. The more work put that is put into a coffee, the higher the cup quality potential. Our coffees will be vac-packed and shipped as soon as possible. Kenya: Some Background. Some Current. There’s no doubt: Kenya is an amazing coffee destination. The promise of finding some of the most unique coffees in the world keeps us coming back year after year. The potential of finding perfection in a cup – coffees with powerful aromas, refreshing acidity, flavors of sweet berries, rich mouthfeel, finishing with a clean and lingering aftertaste – is what keeps us on our toes and constantly searching for more. As you know, perfection is elusive; most of the coffees from Kenya are not exactly like this. My first visit of the season was in mid-December 2011 and I knew it was premature – that there wouldn’t be much to cup. But I also knew it was the perfect time, harvest time, to visit farms and chat with producers about husbandry and cherry picking processes. I also wanted to see the washing stations in full operation. I wanted a better understanding of how and why the coffees taste as great as they do. At the time of my visit, the producers were overwhelmed with the high yields of the season and excited by the prospect of high prices. To give some background, this harvest has turned out to be more or less what it should be, given the fact that last year’s volumes were catastrophically low, which followed a poor harvest the year before that. With volumes 2.5-3 times more than 2010/2011, yields are back on track. Producer and washing station manager alike were convinced coffee quality would be better this year despite the high volume. This is due to more even cherry maturation, leading to better consistency and easier picking. Last year’s rock bottom yields fortunately coincided with the highest prices seen in the Kenyan coffee trade over the past forty years. At least farmers were well paid for the little coffee they did have. Coinciding with record-breaking prices, we paid the very highest – $7.60 FOB Mombasa – for all our AA-lots last year. The washing stations that produce our coffee pride themselves on having some of the best-paid cherry producer members in the country. When I interviewed producers and cooperative managers in December about the situation this season, they acknowledged that the high prices of last year incentivized spending an unusual and disproportionate amount of money on more resources in the field: more fertilization and overall better preparation for the season to come. They were eager to thank buyers for paying such good prices last year. At the same time, they were anticipating the same high prices this coming season. As we now know, 2-12 months later, "the market has come down". NYC is at 220+/- this week, down from 320+ in February 2011. This year’s harvest started late due to unexpected weather patterns during flowering season, followed by rain and cold while cherries were maturing, all resulting in a month’s delay in cherry picking. All our coffees from Kenya are dry milled at the Central Kenya Coffee Mill (CKCM) in Karatina, Nyeri, after initial processing at the cooperative-owned washing stations. I went to CKCM for a couple of days in December and found a lot more coffee to cup than I had expected. Ernest, manager of quality control, roasting and the cupping room at the mill, knows our preferences and had prepared representative samples from previously favored washing stations, as well as samples from new acquaintances. My notes from these cuppings: Karagoto - of Tekangu co-op - a constant winner. Even the very early pickings (November 1st) were stunningly complex and rich in body – characteristics we have experienced from previous years. Tegu - of Tekangu co-op - keeping up with some good lots, but not as outstanding as in previous years. Gatomboya - of Barichu co-op - some good lots, but the early right-out-of-the-drying-bin lots were not as expressive in fruit attributes as we are getting from current crop. Kieni - of Mugaga co-op - a couple of interesting samples; enough to trigger our already established curiosity from last year. Gichathaini, Kangocho, Ndaroini - all of Gikanda co-op - showed some promising super cleanliness, fruity sweetness and an elegance that piqued my interest and had me searching for more to cup. There were other samples but these were not our “cups of coffee”. About the Current Visit The full picture of this season’s offerings remains to be seen but there is no time to waste! I have waited until the last minute to be able to taste as many coffees as possible and have started a process of booking the very best of the 300 samples we have been through this week so far. At the time of writing, there are still quite few samples yet to be presented from the co-ops but whatever is out there now is up for grabs and is being sold – quite literally – off the sampling table. Timing is of the essence in green coffee buying these days. 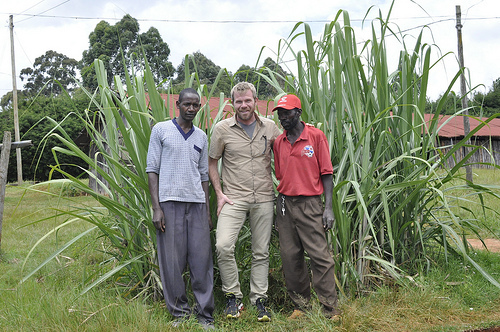 For the sixth year running, Robert will be heading to the Nyeri district in Kenya to buy coffee. Starting Monday and for the following two days, he will spend his days cupping as many coffees as possible to find us the "cream of the crop". The Place At the foot of Mt. Kenya is the town of Karatina and our favourite coffees have consistently originated from here. The Tekangu cooperative owns the washing stations (called "factories" in Kenya) and the Tegu, Karagoto and Ngunguru stations have, in particular, produced fantastic coffee. For now, we'll focus on the Karagoto station because today we cupped a table of samples from Kenya and our favourites come from here. Karagoto is a washing station/factory with 1000 members and the harvest this year has been substantial: three times as big as last year's. While this year's yields are larger than normal, they are also substantially higher than last year's catastrophically low volumes. One of the results of last year's low yields were sky-high prices (the demand remained the same). Karagoto has developed a great reputation and steadily garner more and more interest from coffee buyers based on the merits of their consistently great coffee (i.e. excellent management and farming practices follow through in the cup). This season is a good example of Karagoto's solid management: the people at Karagoto decided to put the proceeds from last year's sales to good use and invested in better husbandry and fertilization. The results of these decisions are showing: the trees are healthier and there is better/more even maturation of the cherries. Management happens on several levels and I will elaborate one in particular: that of factory management. Coffee that is processed at Karagoto is of such a high standard because the managers there are rigid about the quality of the cherries they receive. They will reject cherry that is not up to standard, or they will take the time to sort the unripes out. The Buying Process It is important to elaborate on how we approach buying coffee here because it is both similar to how we approach buying from other regions and is more complex than simply flying into a region, cupping coffee, telling the supplier we want it and then coming home and waiting for it to arrive. The first step is to visit the region early in the season (even prematurely, as Robert did in December last year) to cup samples and determine what the coffee might/will be like when it is eventually harvested. Although he was early and couldn't predict exactly which lots would be best, today's cupping acknowledged the benefits of "going early": the coffees most interesting in December are the ones we liked the most today. In particular, we enjoyed Karagoto's AA and AB samples. AA was sweet and showed a lot of complexity and AB was a more acidic and interesting profile. And now it's time to follow-up on December's trip. As mentioned above, Robert will spend the first few days of his week in Africa (he's going to Ethiopia at the end of the trip) cupping extensively and intensely and will begin the process of getting a shipment together for delivery at the end of this month. We are incredibly excited about the coffees coming from Karagoto - if you want to get your hands on some, contact melanie@collaborativecoffeesource.com as soon as possible. The sooner we know how much you would like, the sooner we can have the coffee sent. Addendum: I would like to add an important development that wasn't fleshed out above that has to do with the process of buying coffee in Kenya. Traditionally, coffee is bought at auction - even the fantastic ones we cupped today. We would like to do away with this time consuming and unnecessary process. We are currently working with the Karagoto factory on buying directly (this term is problematic for me but the discussion on that is for another post/series of posts). Within this context, "direct" means outside of auction. What are the benefits? There are many but from a quality perspective, buying before auction means quicker transport and thus, fresher coffee. But the only way for us to bypass auction is to offer a good enough price. Which is where you come in. Expressing your interest in these coffees now means we can commit to them and have them shipped sooner. Fresher coffee, new crop to your customers sooner, quicker/more direct payment to the supplier. Enough said.